In this season we are inundated with the sights and sounds of the macabre. The ghost that says boo and the bloody zombie that slowly chases us. All of these symbols of death lend a lightheartedness to the realization that death is part of our life path. The emotions we experience as a loved one passes can not be fully described. We vary from sadness to anger and guilt with many other emotions that seem to be beyond our control. As druids we are always communing with our ancestors. We hold great honor for those who have passed before us. Samhain gives us the opportunity to work the task of letting go of to the physical, remembering the mind, and honoring the spirit of those who have passed. As we step into the Celtic Winter we begin to receive the sustaining gifts from The Dagda’s cauldron of bounty. Gratitude is necessary for what we may be gifted with from The Dagda. If your body is craving steak and you receive a can of spam add a little hot sauce and be thankful. The Dagda also blesses us in the Celtic Winter with the opportunity to renew our spirit. The earth mother takes a sigh from growth and production. We see nature retreating. Animals secure their beds and rely on the bounty that the Celtic Summer has provided. We too can retreat into our mind and spirit and take this time to enrich our knowledge of the world around us and of ourselves. The energy of The Mórrigán allows us to simplify and cull negative or disruptive aspects that we may have allowed to enter our life. This is a time of gratitude and introspection. We now have the opportunity to walk the path of the responsible druid. One who is sustained with gratitude in mind, nourishment of body, and enrichment of spirit. Tony preparing for a handfasting. When I think about spring and summer all sorts of wonderful activities come to mind. Weddings, festivals, conferences, and eisteddfods all contribute to the excitement of these seasons. The contributions of those who follow the bardic path enhance all these activities and are an important part of Keltria. For example, during Keltrian weddings and handfastings, we often practice the art of storytelling as part of the ceremony. It is great fun and enjoyed by everyone assembled. We weave the usually mundane story of couple’s meeting into a Celtic wonder tale completely blown out of proportion and peppered with innuendo. For example, the bride is the not so-helpless-princess and the groom is a knight who rescues her anyway. The “best woman” and “best man” tell the story then dissolve into an argument as to whether or not the groom is worthy of the bride and vice versa. With hands on hips, the best man paces back and forth critically eyeing the bride while extolling and exaggerating the virtues of the groom. The groom is subjected to the same scrutiny by the best woman. Each attempts to top the other’s story. These tall tales always contain a bit of truth, as a Celtic boast should. For example, in reality the bride may have cooked a roast beef dinner for her family, but the boast might be that she single-handedly slaughtered the last aurochs when it threatened the tribe. She ate its heart, which gave her the beast’s strength and bravery. Then, she cooked the carcass in a huge cauldron, cast by her own hands, which fed her entire tribe for many days. Ultimately, the dueling duo agree they will allow the wedding to proceed and heartily shake hands. At gatherings, and particularly at eisteddfod, there is a time and a place for the bards assembled to tell stories and enthrall the audience with their skills. We appreciate the opportunity these events provide us to hone our storytelling abilities. 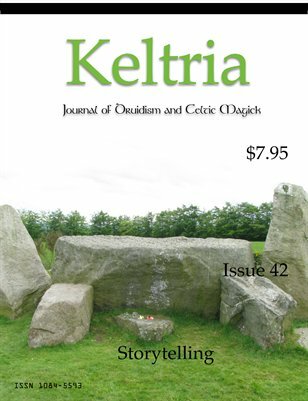 The theme for this issue of Keltria Journal is storytelling. The authors come from a variety of backgrounds and share different perspectives. We begin with Jenne Micale, who, like many of us, comes from a family that did not speak of their history. She carries us along on her personal journey of discovery. Isolde Carmondy and Chris Thompson, the Story Archaeologists, lead us through three different tales of the past demonstrating why telling the stories of places (dindshenchas) is important today. They emphasize that tales of time and place provide a connection and continuity, which explains our place in the universe. Daphne Bishop associates the authors and film makers of today, such as J. K. Rowling, J. R .R. Tolkin, and George Lucas, with ancient storytellers. She challenges us to modernize the ancient Celtic lessons, imbuing them with relevancy to our times, thereby keeping them alive. Mary Gavan, a professional storyteller, describes the characteristics of an effective raconteur beyond the mere telling of the tale. If we follow our personal convictions and succeed against all odds, we become the inspiration for the storytellers of the future. However, stories are more than just the content. The successful storyteller captivates the mind, body and the spirit of the audience, creating an aura of wonder. Finally, in the 1990’s many members of the Henge of Keltria were actively creating new mythology. Inspired by “The Power of Myth” the idea of “MYTH” (Make Yourself The Hero) Keltrians staged “cattle raids” at several festivals. The concept was to capture participants’ “cattle icons”, i.e., stuffed toys, by making imaginative plans and implementing them using guile and skill rather than brute force. At the evening’s campfire, tales were told of the day’s exploits in the form of the Celtic boast. The results were marvelous. Twenty years ago, Beltaine 1993, we published “Cattle Raids”, the first of several stories from “The Book of the Valley”, as an example of how a tale can grow in the telling to become a Celtic wonder tale. Elements of truth weave through the story but Celtic exaggeration runs rampant. The story is clearly among the “Best of Twenty Years Ago.” Enjoy. Send your thoughts and opinions regarding this issue, future themes, or other comments to letterstotheeditor@keltria.org. Be sure to indicate if the letter is publishable. Note: Keltria Journal Issue #42 is available on the Keltria Member Webpage until Issue #43 releases. Typically for this author, Caitlin Matthews’ newest book is a blend of information and practical suggestions. On the information side, she gives us nine meaty chapters describing and interpreting the psychic practices of our druidic Irish and Welsh ancestors. The descriptions go well beyond dictionary definitions and are illustrated by quotations mostly from original sources. In addition, Matthews offers in some cases interpretations not previously encountered by this reader. For example, she touches on the corrguinnacht, the crane posture. In this posture the practitioner stood on one foot, with one hand raised and one eye closed, while performing a spell. According to Matthews, the aim was to “cancel” one side of the body in the physical world so that it could appear in the Otherworld, thus allowing the practitioner to exist in both realms simultaneously. Another such interpretation involves the ancient Irish custom of imposing geasa, or taboos. Matthews describes geasa as soul contracts, designed to protect the soul for as long as the contract was not broken. If the person in question was a king, the protection extended to his kingdom. Violations of geasa chipped away at the soul, and successive violations weakened it progressively. Thus, in the tales of Cú Chulainn and of Conaire, when each had violated all his geasa, he became vulnerable to death. It’s interesting to note that this interpretation links the strength of the body to the integrity of the soul. In the case of a king, again, the health of his soul determined the health of the land. Beyond these and other explorations of ancient Celtic psychic beliefs and customs (e.g., the bull ceremony , the Three Cauldrons, poetic inspiration and so on), Matthews seeks to help readers adapt these customs for personal use today. To quote the author herself, “This book will not make you a seer, but it will help you become better attuned to your instincts, imagination, insight, and inspiration.” When an author makes a claim like this for his or her work, it should always be understood that fulfilling the promise depends almost entirely on the effort the reader/practitioner puts into it. Reading the book is not enough by itself. Nobody gets from Point A to Point B by reading a map. One has to undertake the journey. Matthews gives the reader plenty of help along the way. At the end of each chapter she provides a suggested exercise intended to put the practitioner in closer touch with both the proximate world of Nature and the Otherworld. For example, after the chapter titled “Omens and Divination” she shows how readers, by habitually observing their natural surroundings and noting events that follow, may learn to recognize omens that can inform and guide them. The icing on the cake of this book is a pronunciation guide---always a gift to those not versed in Old Irish. 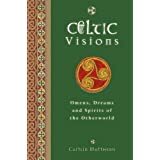 I recommend Celtic Visions, especially to beginning students, for its wealth of information and its usefulness as a guide to personal development. Reiki for the Heart and Soul: The Reiki Principles as Spiritual Pathwork by Amy Rowland. I approached this book with no prior knowledge of the subject but with a curiosity about the topic. bibliography and the suggested reading list. This tells me quite a bit about the scholarship. I prefer books that act as a guidepost pointing me in the direction of further study and Ms. Rowland does this. What is her goal for this book? The title says it all: Reiki principles as a spiritual pathwork or, in other words, to show the reader how to use the Reiki principles for personal development and spiritual growth - - not a bad goal. She makes her case that this aspect of the training is not being adequately addressed in most Western Reiki training. What are the Ms. Rowland’s qualifications to write such a book? She is a certified Usui Reiki Master for over 20 years and a Reiki teacher since 1994. She is also a certified hypnotherapist as well as a clinical therapist. I am first struck by the description of the first Reiki technique and how similar it sounds to grounding techniques that we have all be taught. This similarity between the things I have been taught and what she is advocating runs throughout the book. She presents the goals of Reiki as a spiritual path, an expansion of our awareness of our personal potential and healing of the mind, body, and spiritual both of the client and the practitioner. Ms. Rowland says to start where you are -- very practical advice for anything. She does not show any physical representation of the three Reiki symbols so as not to violate her oaths. The purpose of the first symbol is power and protection; the second is mental-emotion healing and intuitive insight; and the third is distant healing and connection to spirit. The Reiki principles are more of a creed that has many similar versions of it as with anything that was originally an oral tradition: Don’t be angry today. Don’t worry today. Be grateful today. Work hard today. Be kind to others today. The five principles are universal principles. The majority of the book is spent discussing how to develop a working relationship with each of the five principles. There is a chapter on each principle. There are exercises at the end of each chapter. I would recommend this book for a variety of reasons. It is written in a clear, easy to understand style. Anyone with a curiosity regarding Reiki should come away from this book with a basic understanding and should know if Reiki is something they wish to pursue further or not. The suggested reading list is divided up according to the chapters in the book. This should help the reader target the books they need more easily. Even a reader that is not interested in learning Reiki could learn a great deal about how to incorporate these principles into his own spiritual practice. Reiki for the Heart and Soul: The Reiki Principles as Spiritual Pathwork (Paperback); 256 pages; Healing Arts Press; ISBN: 1594772525; ISBN-13: 978-1594772528 - Recommended. [amazon_link id="1594772002" target="_blank" ]The Spiritual Practices of Rumi: Radical Techniques for Beholding the Divine,[/amazon_link] by Will Johnson; ISBN: 1-59477-200-2; pp 192; Inner Traditions; $14.95.